gaining Quadruple Grand Champion title. her very last cat show in the UK before returning to Australia next month. We are wishing Melanie of Snowgum Siberians safe journey home. 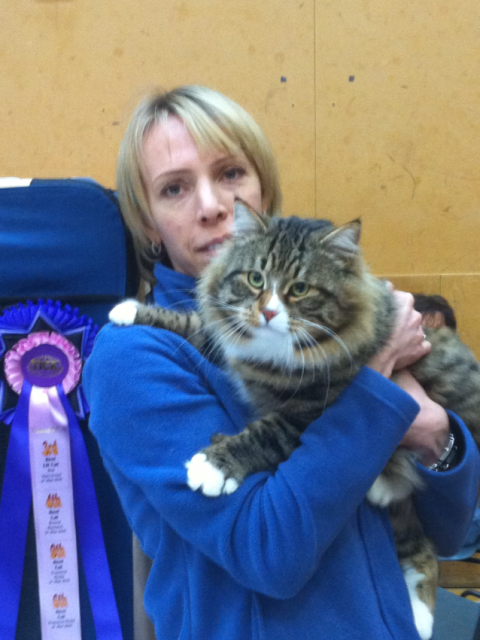 And successful breeding and showing Siberian cats in Australia. Oh thanks Maria! Great pic of us all! The one of me eating cake is a shocker but funny never the less!!! Congrats on Kusik's success- he is a very handsome boy! Counting down to the big move now! Not long to go at all. It is going to be very sad to leave our home here and all the great friends we have made over the 6 years. I've had a great time learning all about Sibis and showing them here. Hopefully we will have some success on the show bench in Australia too.